Current, fresh, recent, modern--they all describe one thing: the contemporary. We've organized this blast around a few shows that focus on contemporary art in a universal, relatable fashion. Even if you don't consider yourself a fan, you must give these shows a try. They really do have something for everyone. Also, don't forget to check out our new blog on the artscope website. It is equipped with updated headlines and rotating featured content -- a great way to stay connected to art and culture news in between artscope issues and email blasts! Online advertising is now also available on the blog as well. 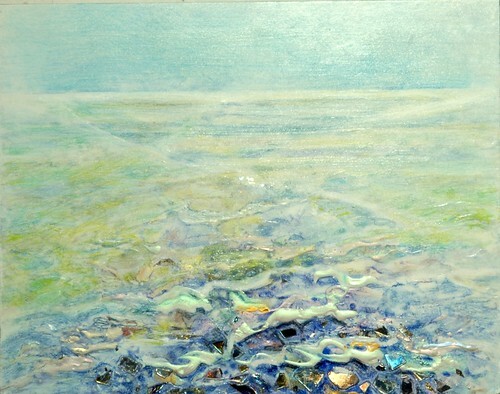 Beach Water by Maureen Ahern, interference paint mixed media. If you're into contemporary art, this is the show for you. Not into contemporary art? This is still the show for you. Curator Barbara Danser has put together In Sight: Visions and Reflections, a collaboration of eight artists that promises to reach every audience member through its multiple mediums and wide range of interpretations. This exhibition hones in on the connection between self and art, a creative relationship that is unique and delicate. These eight individuals portray their visions through sensitivity and process, calling into action the simple and complex combinations of abstract and concrete, form and space, clarity and ambiguity, surface and introspection, and endless approaches to light and texture. The exhibiting artists are: Maureen Ahern, Bonnie Bennett, Kathleen Brennan, Barbara Danser, Jessie Pollock, James Rapa, Earl Schofield, and Pam Tarbell. Some of their tastes, talents, and skills include paintings, ceramics, silkscreen, encaustic, sculpture, mixed media, and works on paper, expressed in both two-dimensional and three-dimensional forms. 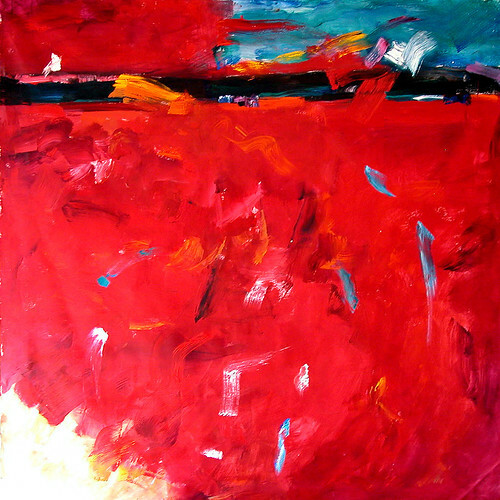 The highlighting feature of this show is the accessibility of all the artwork. Each piece offers insight and subjective interaction, making the artists' "visions" and "reflections" all the more palpable. In Sight: Visions and Reflections will be on view in the Cunningham Gallery of the Jaffrey Civic Center September 2nd through September 30th. Exhibition hours at the Center are Tuesday: 10-6, Wednesday through Friday: 1-5, and Saturday: 10-2. An opening reception will be held on Sunday, September 11th from 4-6pm. Put this exhibition on your to-do list for September simply because it takes contemporary art and makes it tangible for all. "Late Afternoon at Herring Cove" oil on canvas, 24" x 48"
St. Paul's Chapel by Robin Masi, 10' x 8', charcoal on paper, gloves. Nothing can get more contemporary than the thoughts, feelings, and reflections about the terrible events that plagued our nation on September 11th, 2001. On this note, it's hard not to notice that the tenth anniversary of this tragedy will soon be upon us. Whether the past decade has flown by or dragged on for you, we have found a heartening installation to help you reflect on all that has happened. The Witness Project is a site-specific installation by artist Robin Masi and musician Ken Field that portrays the spiritual aftermath of Ground Zero in New York City through physicality of the site's perimeter, large-scale charcoal drawings of the architecture around the site, original music, interviews, and recycled garments. 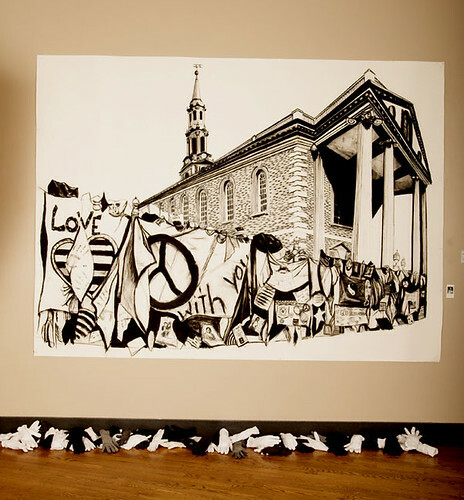 If any of this seems familiar to you, that's because The Witness Project was originally commissioned by the Fitchburg Museum of Art in 2003 and has been on view from 2004-2007 at Harvard University's Lutheran Church Gallery, Newton Interfaith Society, and Regis College. Even if you've seen this installation in previous years, you can't skip out on this viewing. In its new location at Northeastern University's Gallery 360, The Witness Project offers updated drawings depicting the new design of the site including the World Trade Center, 9/11 Memorial, and the Calatrava PATH Station. Never before seen interviews will feature the following: Fr. James Martin, a priest who offered mass at the site and pastoral counseling for the rescue workers; The Crafts/Brown family, neighbors near Ground Zero; and Lynn Brewster, a respite worker from St. Paul's Chapel. The Witness Project will be on view at Gallery 360 August 22nd through September 13th. An exhibition open house will be held on Sunday, September 11th from 10-7pm. Come reflect and ponder in the sanctuary environment this installation has created. The primary sponsor for the event is Northeastern University Spiritual Life Center in collaboration with Sacred Threads Women's Spirituality Center. In conjunction with this inspiring project, the Interfaith Program and Panel, Ten Years Later: Where Are We?, is set to be held on Saturday, September 10th from 9:30am to 12pm in the Curry Student Center Ballroom at Northeastern University. James Carroll, award-winning author and columnist for The Boston Globe, will be leading the discussion. There is limited space for the conversation, so make sure to register and pay online as soon as possible. Artwork from Alison Wells' solo exhibition at BAC. Although the idea of home can be considered traditional, artist Alison Wells explores it in a contemporary fashion in her upcoming solo exhibit. Home is Memory, Memory is Now ignites the relationships and cultural bonds that transcend geographic and historic differences, renewing the idea of "home" over and over again. Shifting concepts of home and place are at work in Wells' art, expressing ideas of culture and identity in a universal, yet personal sense. Having foundations in Trinidad, Jamaica, and New England, it is no wonder why themes of home and place are pertinent to Wells' work as an artist. "My work explores the search for an identity between Trinidad and the United States. I view home not as a physical place but as changing memories and dreams impinging on reality. In this conflict, my paintings become a mediator for [the] push and pull of these familiar and unfamiliar cultural aspects as they try to redefine the idea of home and identity," says Wells on the work featured in her solo exhibition. 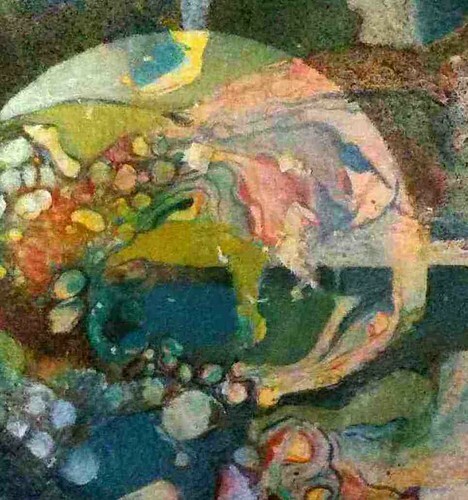 Her acrylic and mixed media works on paper and canvas portray Wells' fluid identity in time and space. It is within these works that she harnesses the power and instrument of culture and uses it to depict her universal message of home and community. Paint and shapes dissolve into one another, mimicking the movement of memories in and out of the conscious and subconscious mind. It isn't so much ambiguity that is at work here-it is more of a consistent shifting that allows the viewer to reconsider their permanence in their world of "home." Home is Memory, Memory is Now will be on view at the Brookline Arts Center from August 29th through October 7th. An opening reception is scheduled for Saturday, September 10th from 6:30-8:30pm and it is supported in part by the Brookline Commission for the Arts, a local group which is backed by the Massachusetts Cultural Council, a state agency. The exhibition will culminate with a mixed media collage workshop for children and teenagers on themes of home and place.